In partnership with Golden Rule Plaza Inc. (GRP), a nonprofit subsidiary of Bible Way Church, and the Henson Development Company, Mission First is building the Plaza West project at the northeast corner of 4th and K Streets NW. 50 two and three bedroom units will provide affordable housing for grandparents raising grandchildren and will serve families making 30% – 60% of area median income. 173 units will provide affordable housing for individuals and families making less than 60% of area median income, with eleven units set aside as permanent supportive housing for Department of Behavioral Health consumers. This development project is financed with tax exempt bonds issued by DC Housing Finance Agency and 4% low income housing tax credits. Citibank purchased the tax exempt bonds and is providing construction and permanent financing. Capital One was the end investor on the tax credits that were syndicated through Enterprise. The DC Department of Housing and Community Development and the DC Department of Behavioral Health provided gap financing for the project. NOW LEASING: Click here for details on living at Plaza West. 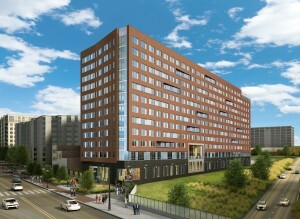 The Grandfamilies component will feature a specially tailored support services program — the Plaza West Community Life Program – targeting both senior and youth residents through a program rich with activities, on-site resources and services, and connections to services in the nearby community. The combination of on-site programs and referrals for community-based services will address a wide array of residents’ needs, including those related to job training and employment, parenting, academic support, food assistance, furniture, clothing, recreation, physical and mental wellness, and legal aid. While residents will be able to choose their level of participation in community life activities, the staff will actively reach out to engage residents. Click here to learn about funding opportunities for Plaza West.